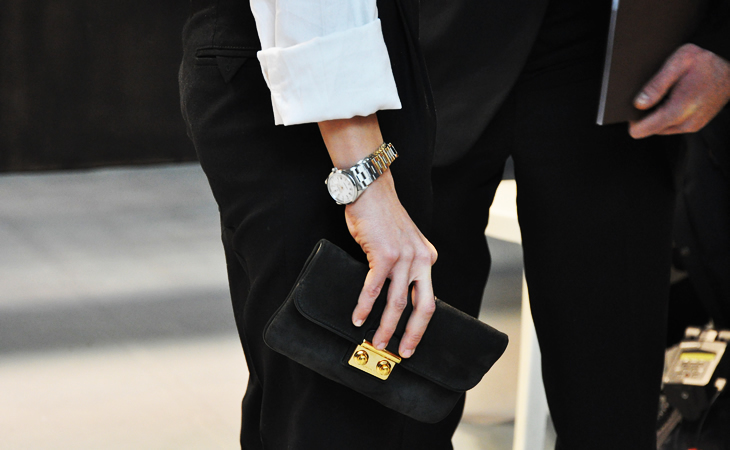 Last week I spoke about one of the most classic combinations in fashion town, black and white. I immediately had this image in my mind and yes, I already posted in once, back in the days, but I hope that you agree with me: it one of those pictures that deserves a repost. For me, it represents the epitome of elegance. Never get tired of this image. So chic and elegant! and that clutch reminds me of Sophia Copolla clutches. (Btw i was thinking about it, when i was in my workspace, creating something new, have seeing that clutch before! ha and instantly i now, just a thought Marzena) well back to work now! have a lovely week!! Love this look. Navy and black as well… apparently taboo but in my book the chicest colour combination there is! I’m completely on your side when it comes to the navy/ black combination. Not to mix them would be such a pity.